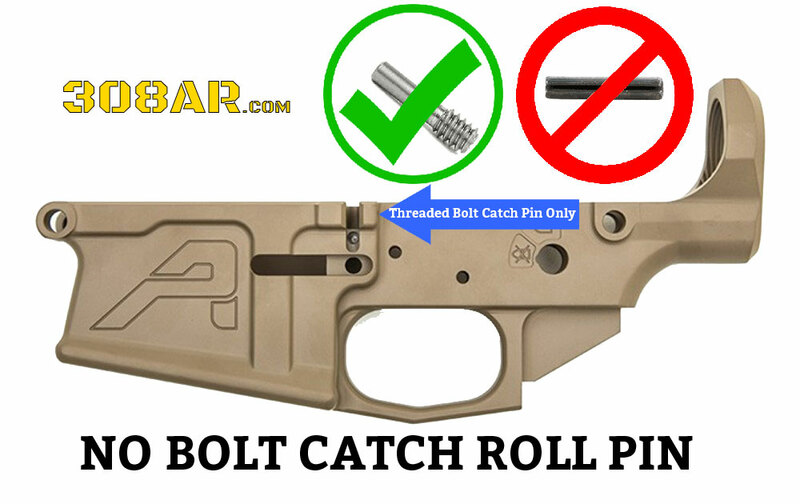 Early on at 308ar.com we did a page that referenced the the point that the Armalite AR-10 utilized a BOLT CATCH ROLL PIN same as the Armalite M-15 (AR15) rifle while the DPMS LR-308 308 AR and similar rifles utilize a BOLT CATCH SCREW. Well despite that page we still get many questions about this small part. Based on these messages I decided a simple picture might be easier to understand in this day of sort attention spans. While I believe there are a small minority of 308 AR manufacturers using BOLT CATCH ROLL PINS just as there is an AR-15 manufacturer or two have adopted the BOLT CATCH SCREW feature. This post is meant to make folks aware of the differences. AERO PRECISION BOLT CATCH SCREW – Aero Precision refers to this part as the M5 Threaded Roll Pin. Our threaded roll pin is used in multiple applications, including for the bolt catch on our M5 Lower Receivers and for the forward assist on our Upper Receivers. Made from stainless steel, it has a 6-32 thread pitch and is designed to be installed with a 1/16″ Hex Key Wrench. Note: This product is already included with our M4E1/M5E1 Enhanced Uppers, M4E1 Threaded Uppers, M5 Upper Receiver and our M5 Lower Receiver. It is not necessary to be purchased separately. This individual product is available for customers who have lost or damaged their existing threaded roll pin.